SUZUKI VIOLIN LESSONS | . 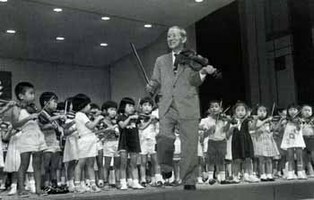 Suzuki Violin Lessons incorporate early beginnings, a high degree of parental involvement, lots of listening, a fantastic repertoire and continuous review of previously learned pieces, well-established learning by ear before reading is introduced, group learning and extended learning experiences, and a focus on character development. If you are currently learning the violin or viola then this website has information, links, and resources especially for you! Hopefully, I can assist you in your learning process as you study one of the world’s most difficult, beautiful and rewarding musical instruments. There is information about how to make the most of your practice each day and make it fun, how to choose an instrument, how to take care of your instrument, how to set up a practice area, information about Suzuki and his method of building talent in every child from a very young age. Dear Jason, thank you so much for a wonderful year yet again. Your kindness and patience yet persistence are so inspirational and refreshing. You are a man of many talents and the wonderful way you teach is the reason Dom and Elaura appreciate you so incredibly much.